Holy crap they were even worse than I thought. While my brother worked on prepping his Saab for frame repair, I took some time to give my truck (a ’95 Sierra) some long-overdue TLC. While I had the hood open one day, I noticed that the air cleaner wasn’t level with the rest of the the truck. It was leaning slightly towards the passenger side. And on these trucks, if the air cleaner’s not level, then the engine isn’t either. So I looked closer, and saw the upper bracket hovering suspiciously close to the frame (sorry, forgot to take pics. But trust me, it was visibly crooked. So that clue you in to how bad it was). 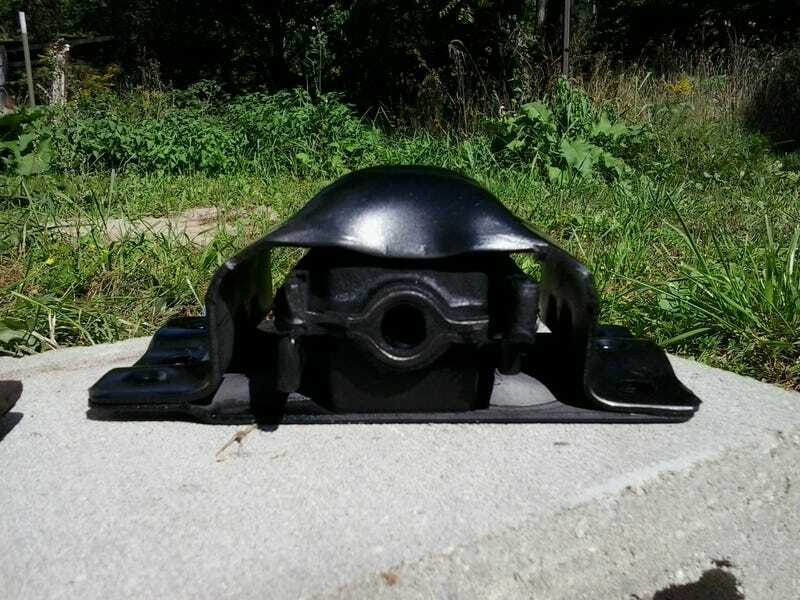 That bracket was partially obscuring my view of the actual mount, so I took a chance and figured that that was probably all I needed to know, and ordered up some new mounts for both sides, as well as a transmission mount to complete the package. Once the parts came in, I painted them up, and let them dry before getting to work on removing the old ones. Installation day came, and boy what a pain! I thought the hard part was going to be rolling around underneath the truck with the legs of the engine hoist in my way. But no, it was the narrow opening in the frame near the control arms that I had to work through in order to get to the nuts that held the mounts in place. Especially the upper fasteners. Those, I couldn’t even get a socket on, due to the angle. So I ended up using a Harbor Freight low-profile serpentine belt tool with a crowsfoot to hold the nut while turning the bolt out from the top. Once both of the new mounts were finally in, I took a look at my belt tool and saw that the stress of holding the nut had started to twist the 3/8" drive square. It was never meant for this, but it got me through and I’m not sure how I would have done it otherwise (aside from removing the control arms). Unfortunately, I dropped a couple of nuts somewhere in the frame when I tried to precariously hold them up with the crowsfoot, so I’m going to have to find them and finish bolting down the mounts before I take it for a test drive. Which I’m eager to do, because I see some shiny spots on the old mounts where I’m sure it’s been rubbing, and I think that explains another issue I’ve been having. Because come to think of it, there has been a brief loud squeal each time I put the truck in gear, as the powertrain lurched forward. I thought that it might be the brakes (which actually DO need some attention that I will post about soon), but now I’m pretty sure that noise has actually been the mounts. You see, that inner metal sleeve is supposed to be suspended between more-or-less equal amounts of rubber both above and below inside that shell. The lower portion was GONE. Dang, I should have done this a lot sooner! With the new engine mounts in place, the engine now stands proudly level again, with the brackets hovering further away from the frame. After changing the front mounts, I changed the one under the transmission’s tailshaft housing, which was a piece of cake. This one wasn’t nearly as deteriorated, and was the same Anchor brand part that I was replacing it with (this one wasn’t made in China nor USA like the motor mounts though, apparently this one is from Korea, go figure). Somebody probably already changed this one before, but didn’t bother to do anything about the front mounts.